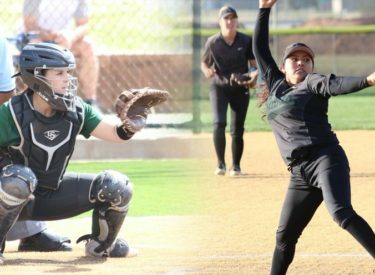 LIBERAL, Kan. – The Seward County battery responsible for the most wins in Lady Saints history are now going their separate ways after signing with four year schools. Pitcher Monique Ashley has signed with NAIA Bellevue University, while catcher Sage Harrison has signed with Division II Francis Marion University. Ashley, one of the top aces in Lady Saints history, leaves Seward County with her name etched in the record books. She owns the record for most career wins (54) and games pitched (75), while ranking second in win percentage (.758), strikeouts (527) and innings pitched (415.0) with an ERA of 2.13 (5th all-time). She also owns the records for single season wins (27) and strikeouts (310). Her wins and strikeouts ranked her second in the nation in those categories. Ashley is was also awarded the NFCA NJCAA DI First Team All-Region and NFCA Third Team All-American for her efforts her sophomore season. Ashley will join a Bruins squad that went 32-24 a season ago under 10th year head coach Michala Cimino. Battery mate Sage Harrison put up equally impressive numbers at the plate her sophomore season, setting the Seward County single season record for home runs (22). She also ranks 6th in single-season RBI (62). Harrison tied the career home run record in 2018, going yard 35 times in her two year career. Harrison showed extreme durability, starting all 124 games behind the plate over the past two seasons, catching 27 runners stealing in the process. Harrison joins a Patriots team that went 19-25 a season ago. She will look to bring power to a squad that only hit 36 home runs on the season. Harrison will play for 14th year head coach Stacey Vallee.